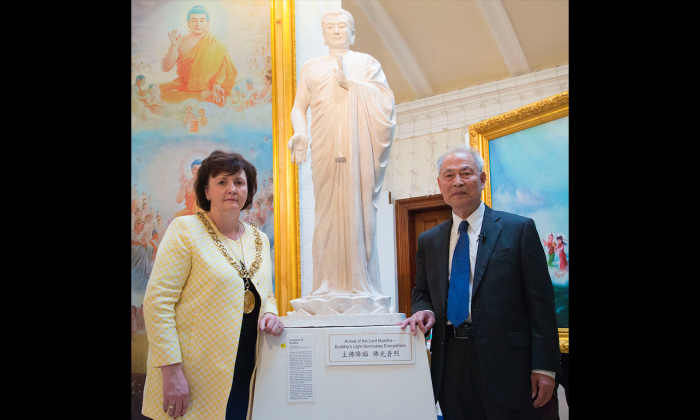 A groundbreaking set of artworks revealing the history and present persecution of the international qigong practice of Falun Gong finally crossed the Atlantic from New York to Glasgow to begin a Europe-wide Tour. The Art of Zhen, Shan, Ren (Truth, Compassion, Tolerance) International Exhibition has toured the world since 2004 and has been radical in using high quality reproductions of original paintings and sculpture. A new version of the Exhibition was seen at Pollok House, a grand Georgian home three miles from central Glasgow, the largest city in Scotland and one of the largest in the UK. The artworks in Pollok House were the first showing of the higher quality reproductions more accurately representing the originals. Printed on canvas by an exceptionally fine process, they have been framed to match the originals and are the same size as the originals. Not only does replication help more people experience the unique art, with often two exhibitions being shown in different parts of the world at the same time, it also minimises sabotage by the Chinese Communist Party (CCP) that has been trying to wipe out the practice, and its social and cultural manifestations, since 1999. Two of the paintings, including the largest, which is over three metres high, have been specially repainted by the original artist. A sculpture of a standing Buddha is being shown outside the US for the first time. It was made from a mould of the original specially to travel with the Exhibition to Europe. The sculptor, Zhang Kunlun, was a professor of art in China before the persecution. He lost his job for refusing to give up his practice of Falun Gong and was repeatedly tortured before international pressure secured his release in January 2001. Only one artist of the group of eighteen is caucasian, although the work is predominantly of the Western Tradition with antecedents in fifteenth and sixteen century Europe. The artists call their work New Renaissace. Many of them were persecuted for practicing Falun Gong in China. Most now live in the U.S. or Canada. The Exhibition was officially opened by The Lord Provost of Glasgow, Councillor Sadie Docherty, on October first. She was referring to the painting Organ Crimes by Dong Xiqiang. It depicts a scene in a rather dim Chinese operating theatre where a Falun Gong practitioner strains in agony on the operating table. Three men hold him down, one is wearing a military uniform. A man in surgeon’s clothes and rubber gloves holds a blood-drenched organ in his hand above the victim’s chest. Since 2006, more information has come to light about the forced extraction of organs from live prisoners of conscience in China. Investigations by David Kilgour and David Matas, both nominated for the Nobel Peace Prize for thier work on organ harvesting crimes against Falun Gong practitioners in China, and Ethan Gutmann, whose book The Slaughter, about Falun Gong and the Chinese state, is due out next year, have revealed that organs are extracted from prisoners of conscience in China often without anaesthetic. The organ harvesting is done to supply rich recipients in China, Japan, the U.S. and Europe. Like many visitors to the The Art of Zhen Shan Ren Exhibition throughout the world, he was uplifted by the works despite the punishing content of some of them. “I really enjoyed these pieces,” he said. “Looking at the stories underneath the paintings and the graphic detail of the paintings, very harrowing and heartfelt. Describing the quality of the works, she said, “You see it on television but it doesn’t mean as much as seeing these paintings have done for me today.” She became very emotional at this point. “They must have been heartbreaking for the people that were painting them,” she said. “I am so glad I came. I’m so full of admiration for everybody. Thank you for giving me this opportunity to see these paintings,” she said to the organisers. The UK wing of the Exhibition, run by the charity Zhen Shan Ren Arts (UK), continues with its standard set of pictures in Cardiff, the capital of Wales in the UK. It will be open to the public from October 15th to November 6th. The final UK Exhibition this year will be in Cirencester, in the Cotswolds, from November 30th. And this expanded form of The Art of Zhen, Shan, Ren (Truth, Compassion, Tolerance) International Exhibition will move to mainland Europe, probably Latvia, but this has not been confirmed.